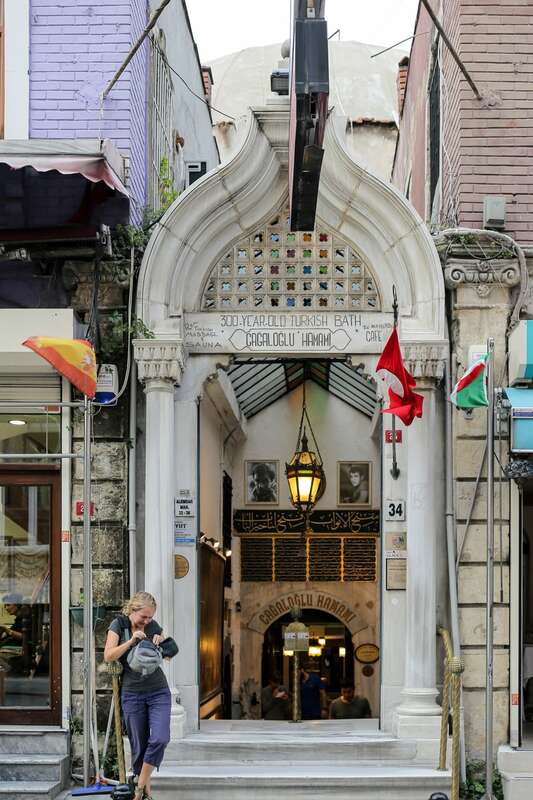 We knew we wouldn’t have much time to explore the Asia side of Istanbul, but we wanted to try and squeeze it in. 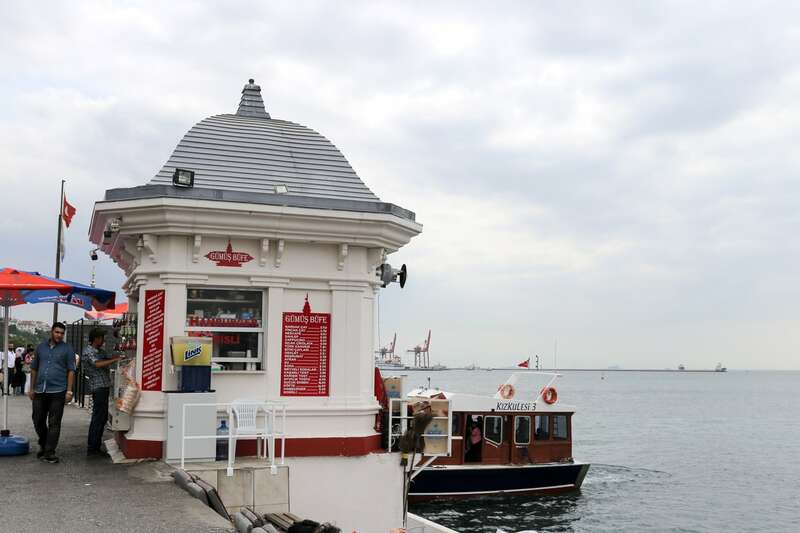 It also worked well with our plan for the day, wanting to ride the Marmaray between Europe and Asia (the new commuter subway connecting running under the Bosphorus), to see the legendary Maiden’s Tower, and to walk along the cities ancient land walls. 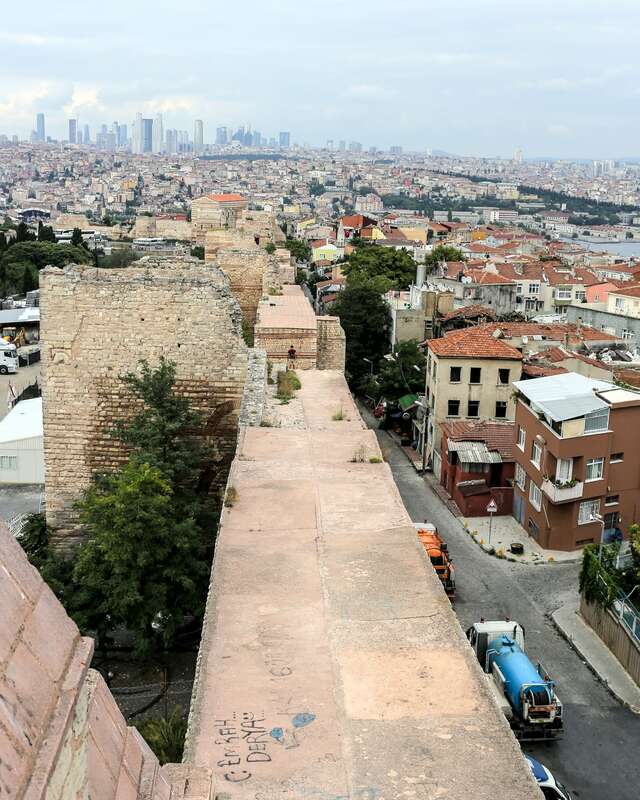 The land walls, however, are actually well into the European side of the city, not the Asian side. 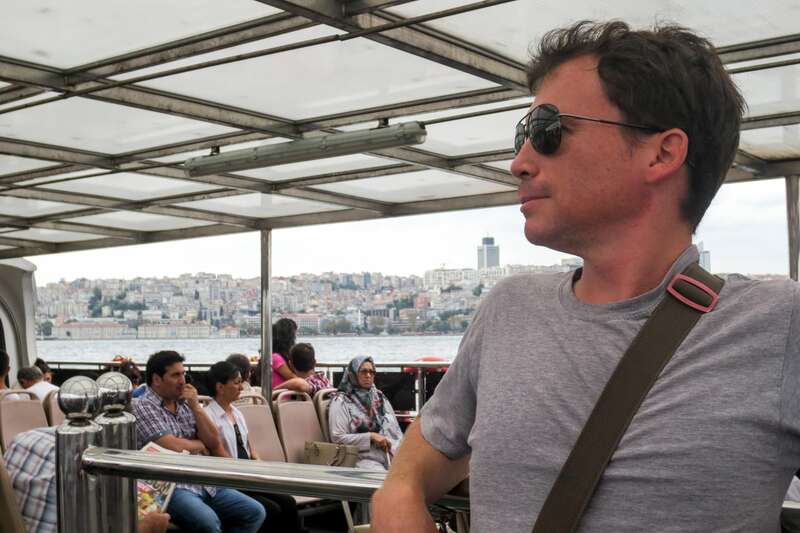 Our thinking was that we would ride the Marmaray over to Asia, then take a ferry back across to Europe, hopefully taking us a few miles up the Golden Horn to the beginning of the land walls. 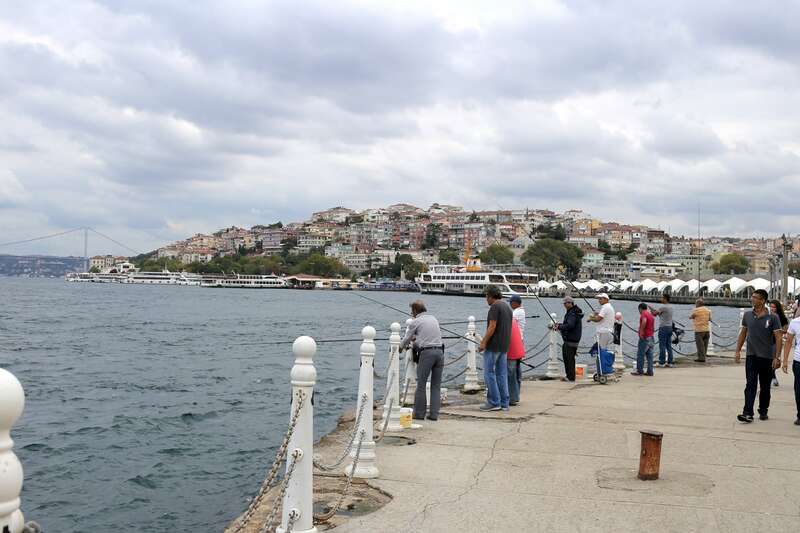 We confirmed that this was indeed possible with a number of people, yet our ferry only got us about two-thirds of the way, forcing us to search around for another ferry. 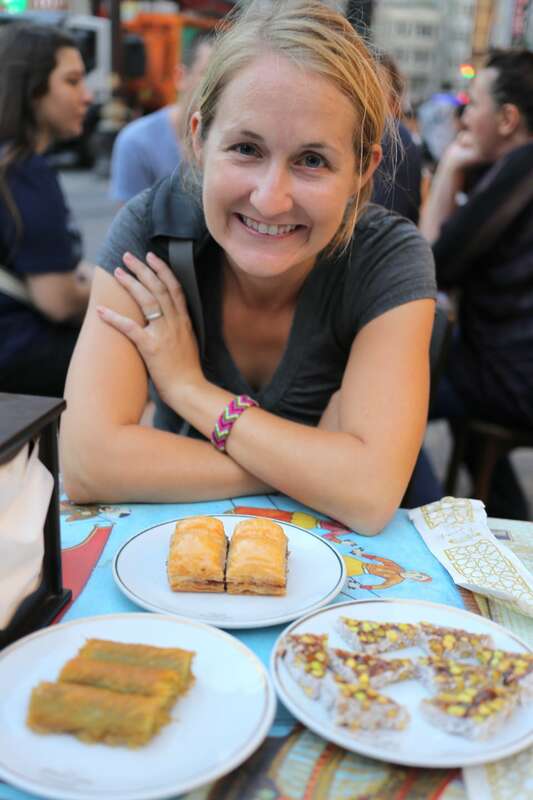 In the end, though, it all worked out and made for an exciting and fun-filled day, exploring Istanbul’s past, present and future. 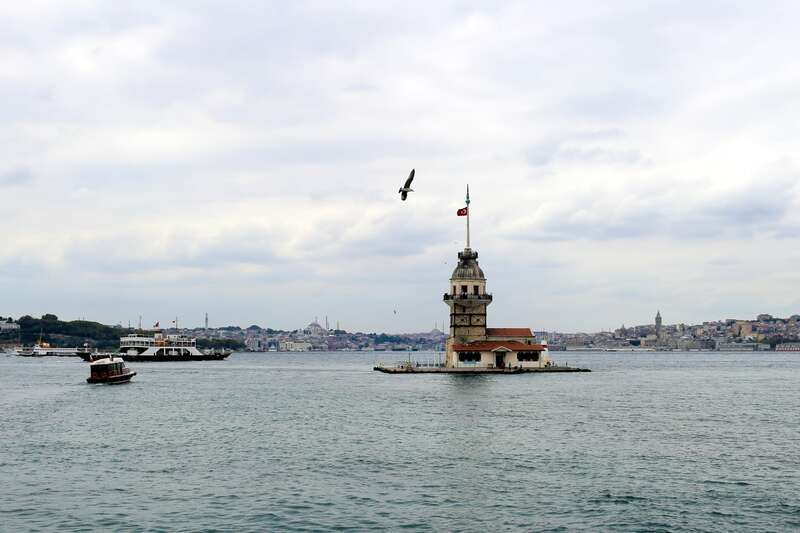 The Maiden’s Tower (pictured above), just off of the Asian bank of the Bosphorus in the center of the city, has an interesting and varied history. There’s of course the two legends attributed to the building of the tower — one involving an emperor’s attempt to thwart an oracle by imprisoning his daughter in a tower for 18 years to protect her from snakes, only for her to be fatally bitten by one hidden in a fruit basket given by her father on her 18th birthday; the other involving a love story between two ill-fated lovers. 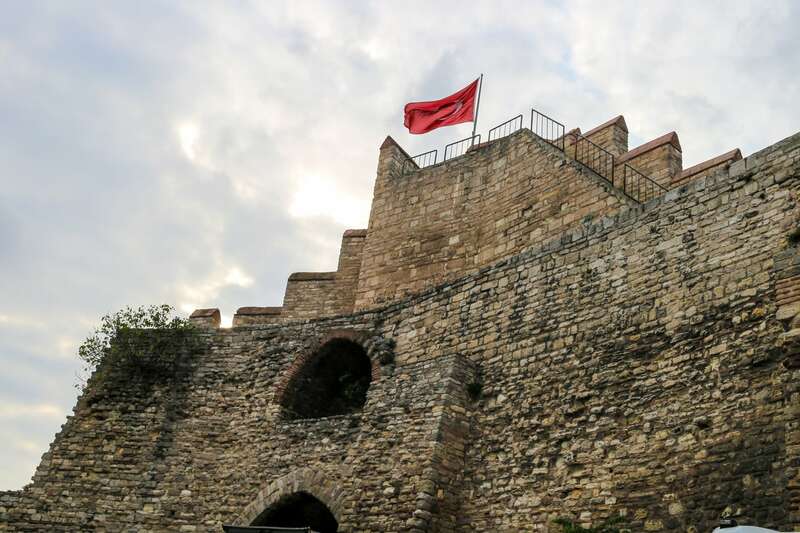 And then there’s the historical record, which points the the tower being constructed in the 12th century for the purposes of connecting a chain across the strait in an attempt to control access to the city. 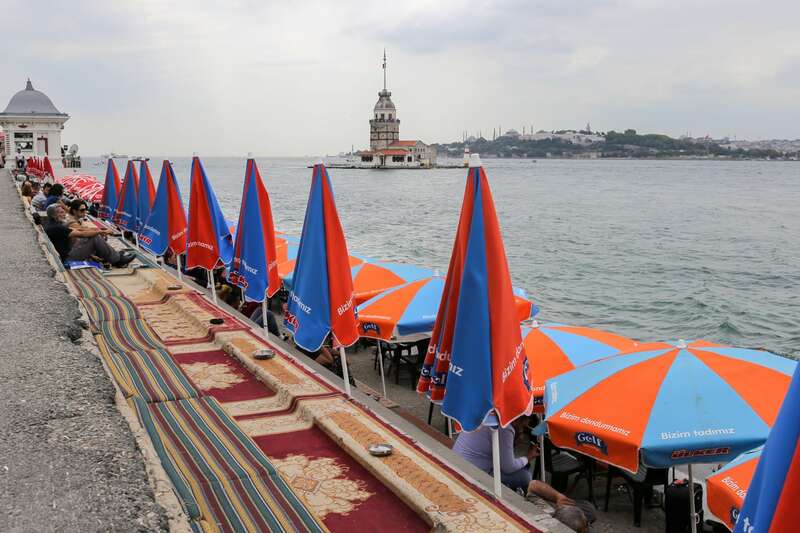 The Turkish seem to prefer the legends over the historical record. On the ferry back from Asia, a man emerged selling a small kitchen gadget that appeared to core cucumbers. Lori and I have seen the scenario play out a hundred times in a number of different countries. We watched the man emphatically spout off a prolonged sales pitch (in Turkish) to his captive audience, all the while assuming that it would end like they all do…one or two people will shell over a few bills for the silly contraption, while the rest of the onlookers feign any expression that doesn’t communicate interest. NOT TODAY! The moment he finished, sheer mayhem ensued as folks of all ages pushed others away to get their hands on the gadget. Dozens and dozens of gadgets flew out of the man’s bag as fast as he could collect payment (which was pretty darn fast). When the ferry reached its final destination, maybe 20 minutes later, the whole ship disembarked proudly carrying their new, shiny cucumber corer. Hopefully the salesman is getting his cut of the action from the cucumber sellers near the ferry pier, as I’m sure they own him one. And then there were the cats. 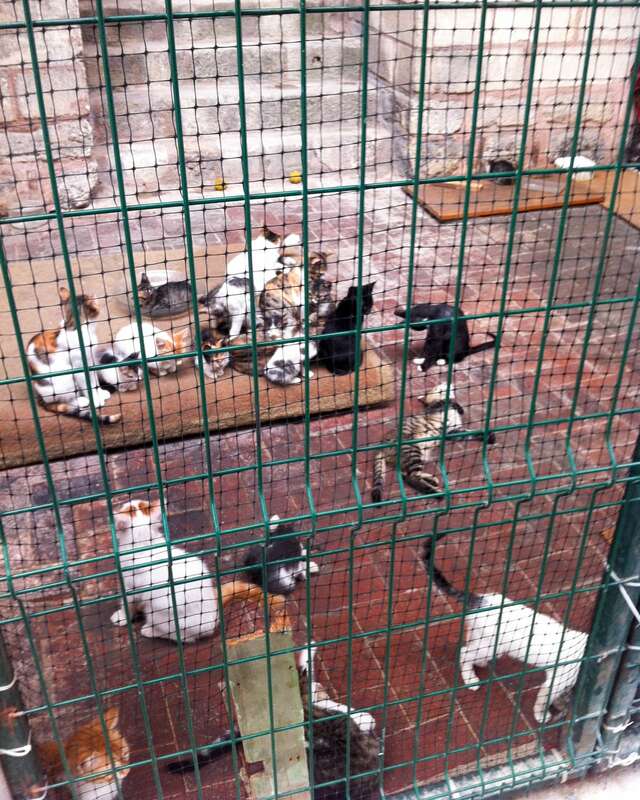 Lots and lots of cats. 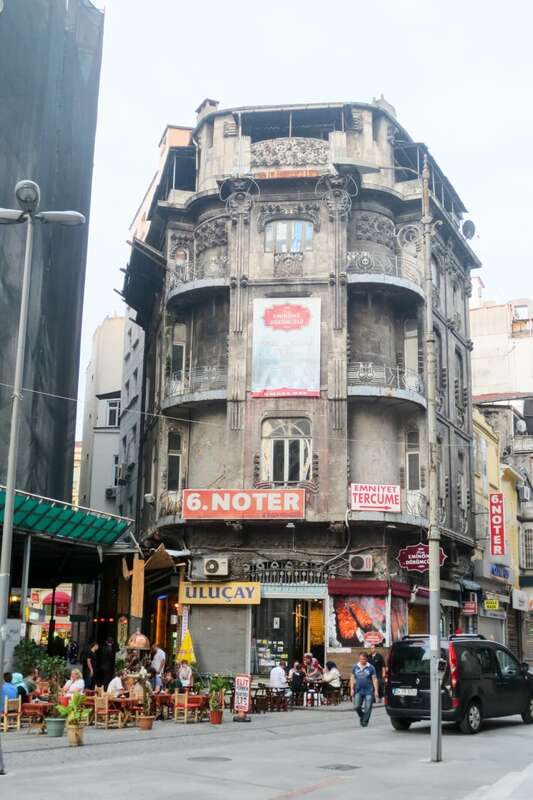 I explored the Turkish obsession with cats in earlier Istanbul posts. One reader actually chimed in (it was a big day!) 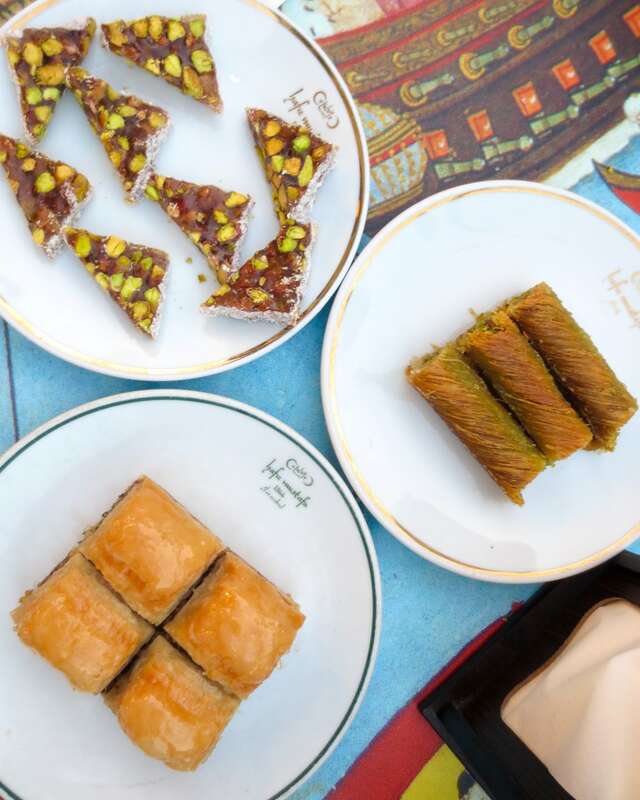 and suggested that the abundance of felines might have something to do with Turkey’s strong Muslim influence, since cats are revered in Islam. The scene above looks worse than it actually is. The cats are actually confined to a large series of chambers of an old fortress complex, so they have plenty of room to roam. They also appeared to be well fed. Now, why there are so many of them enclosed in this particularly area, I can only guess. 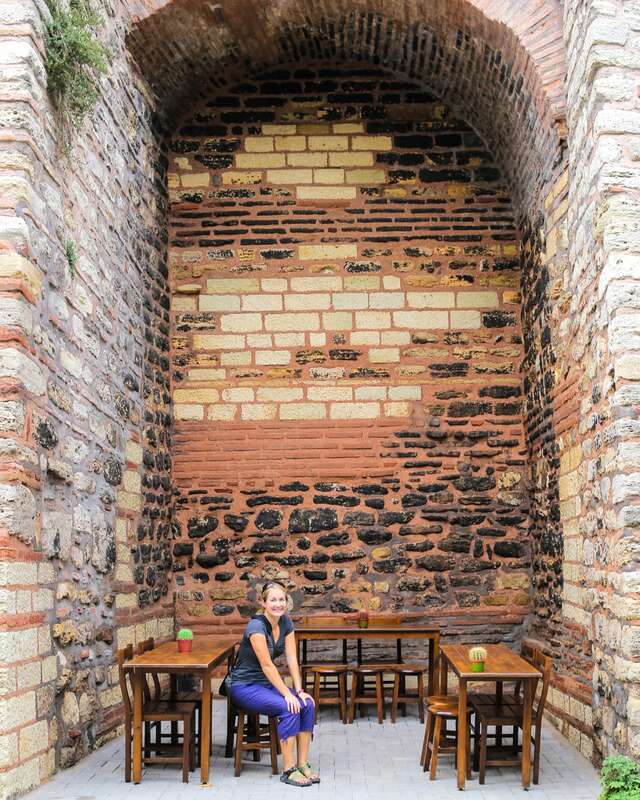 While exploring the ancient land walls of Istanbul, we came across a coffee shop, perfectly positioned to take advantage of all two of the wall’s visitors on this particular day (us). 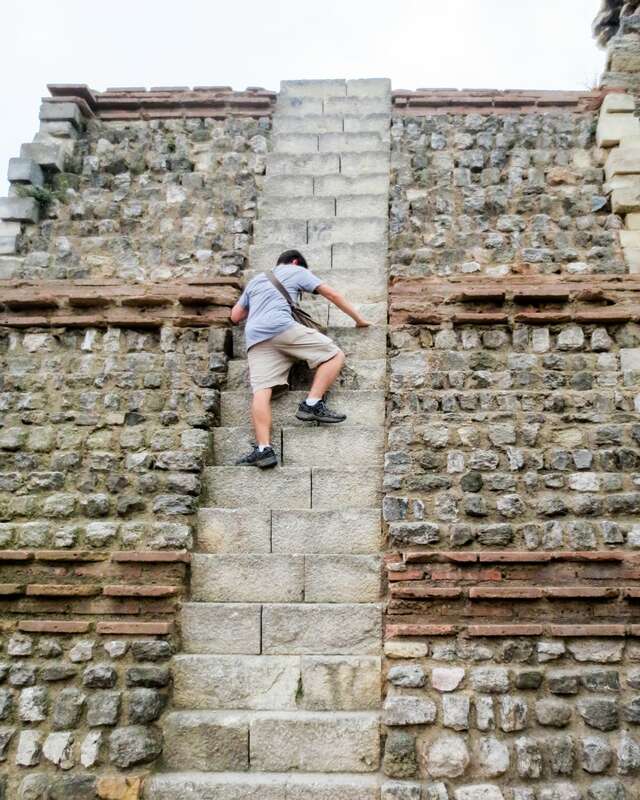 Actually, we did come across two young Turkish guys during our four hours along the walls, but they seemed to be more interested in snapping epic selfies than the walls, themselves. Nonetheless, the coffee was excellent, and the ambiance was even better. They even had seating in one of the old alcoves formed by a particularly mammoth portion of the ramparts. So what are these land walls, you ask? 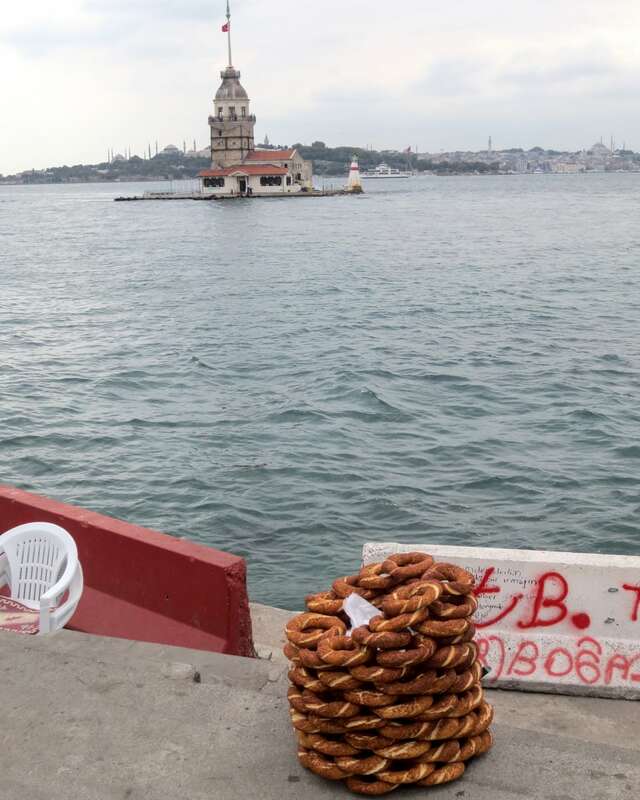 Well, they are a series of fortifications begun shortly after the founding of the-city-formerly-known-as-Constantinople (aka Istanbul) in the 7th century, B.C. The walls were constructed for the usual purposes of keeping invading marauders out, and the good times, in. 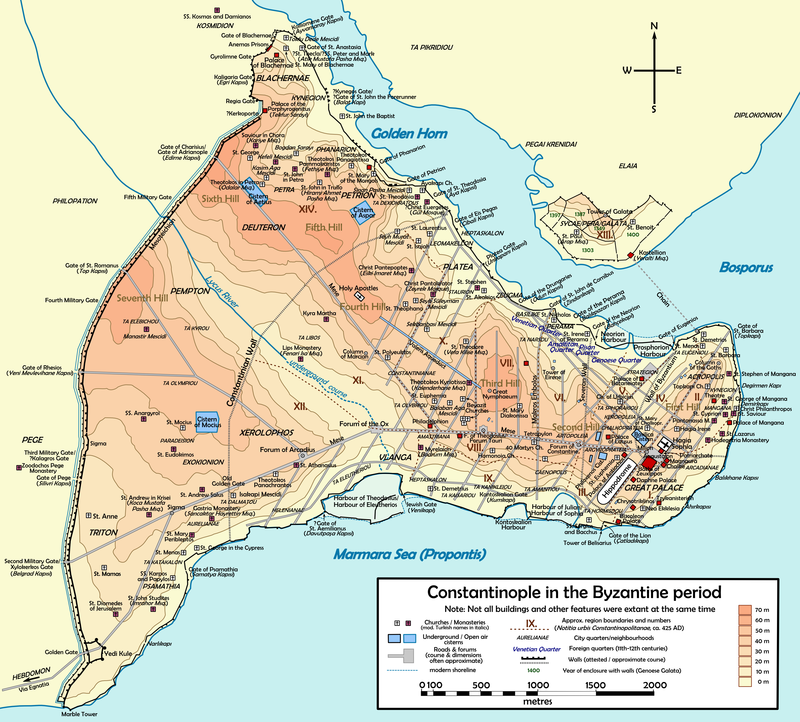 Map of Constantinople, showing the original Constantinople wall and the Theodosian Wall added later in the 5th century (Photo: Cplakidas / Wikimedia Commons). 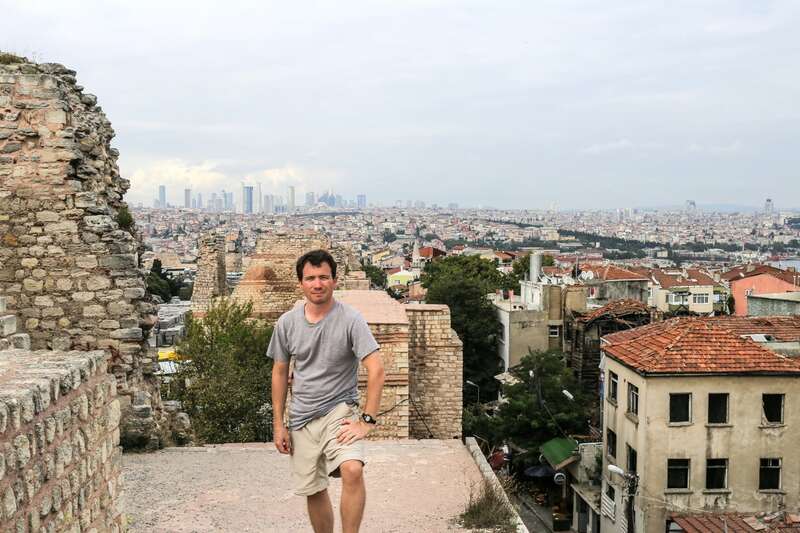 We walked along remaining stretches of the Theodosian land wall, which was constructed in the 5th century, A.D. Most of the wall is either in poor shape or no longer exists. 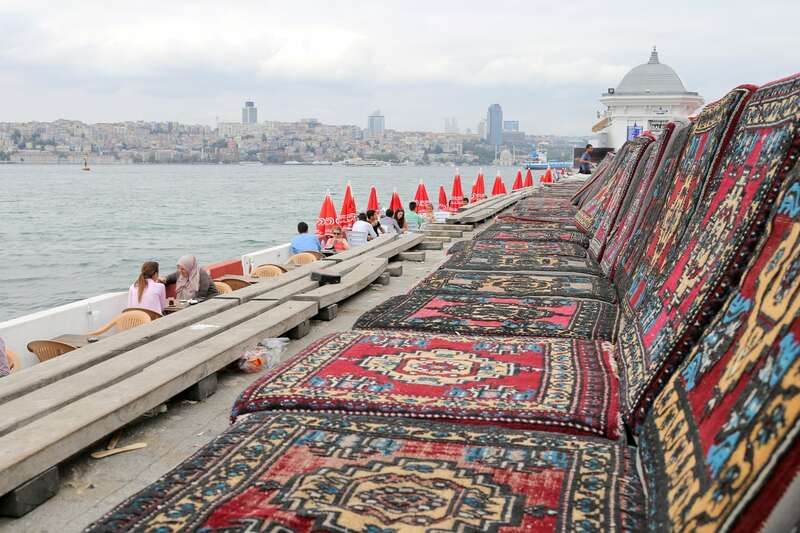 However, a small stretch beginning at the Golden Horn and running south has been preserved or restored. 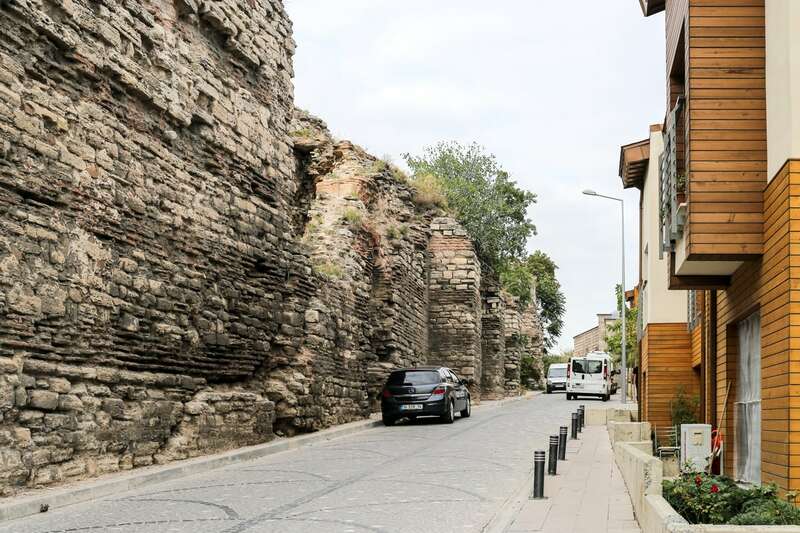 The land walls cut through interesting neighborhoods that are far different from those in the old city, lending a different perspective on life in this city of 15 million. 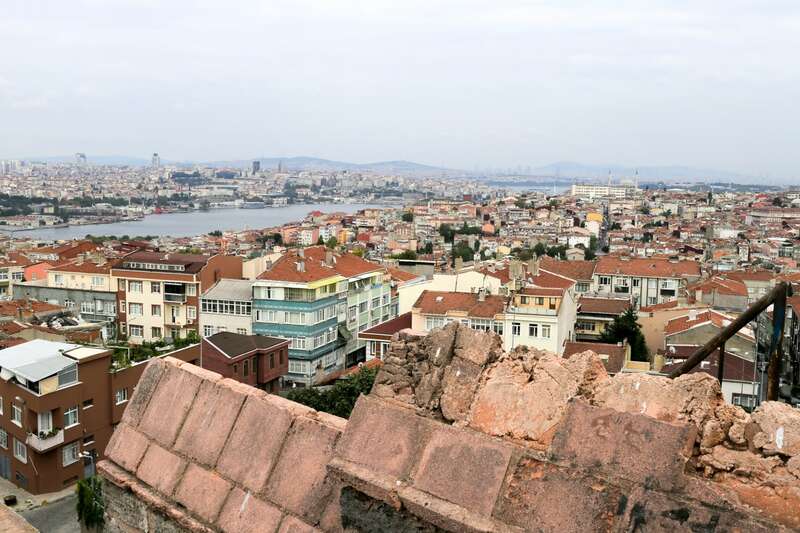 The walls also offer awesome views of the massive sprawl that is Istanbul in the 21st century. 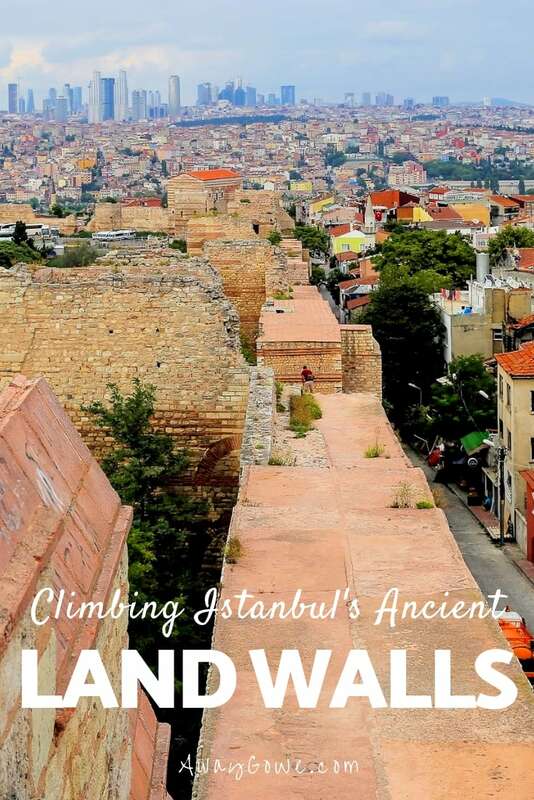 From the land walls, you can see all the way to Levent and Maslak, Istanbul’s two booming financial districts which are located several miles to the northeast and are virtually invisible from the old city. Essentially, this city is so huge that we spent five full days exploring it and didn’t even come close to the financial heart of the city. 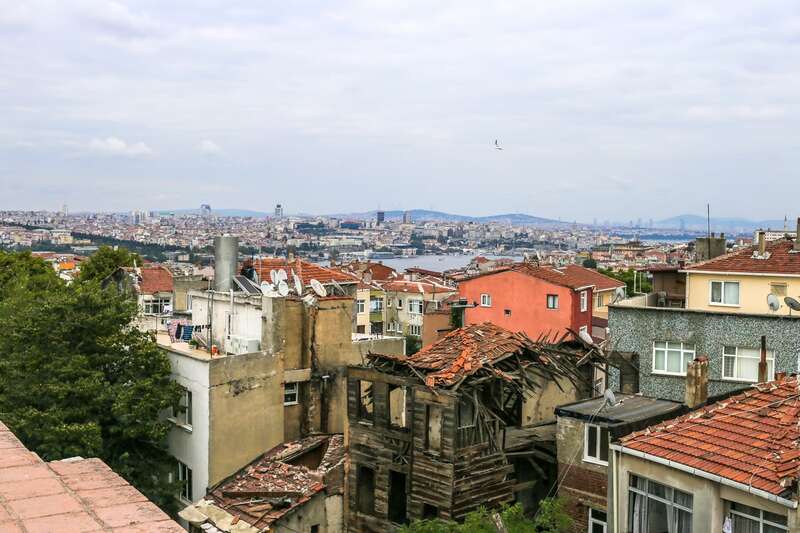 The land walls also offer a glimpse into Istanbul’s meteoric rate of gentrification in some areas. 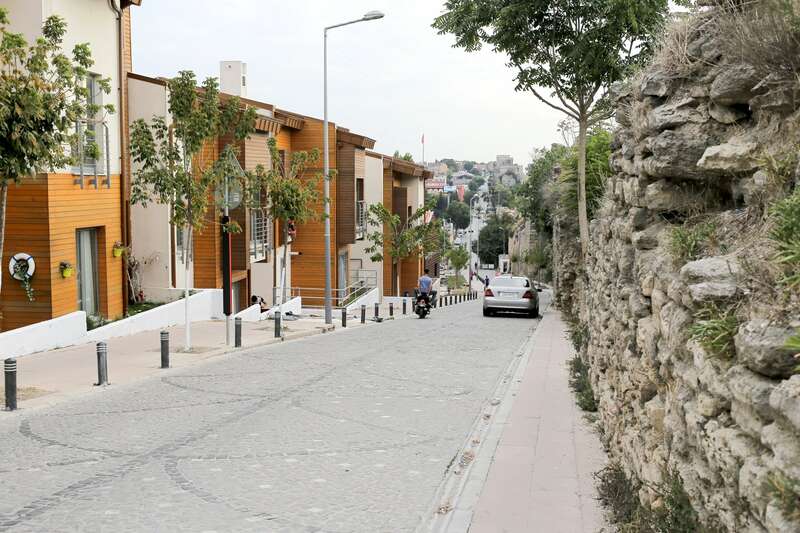 This street begins in a fairly run down area of town, and within blocks transforms into brand new luxury townhouses with high-end supermarkets, restaurants and other amenities. 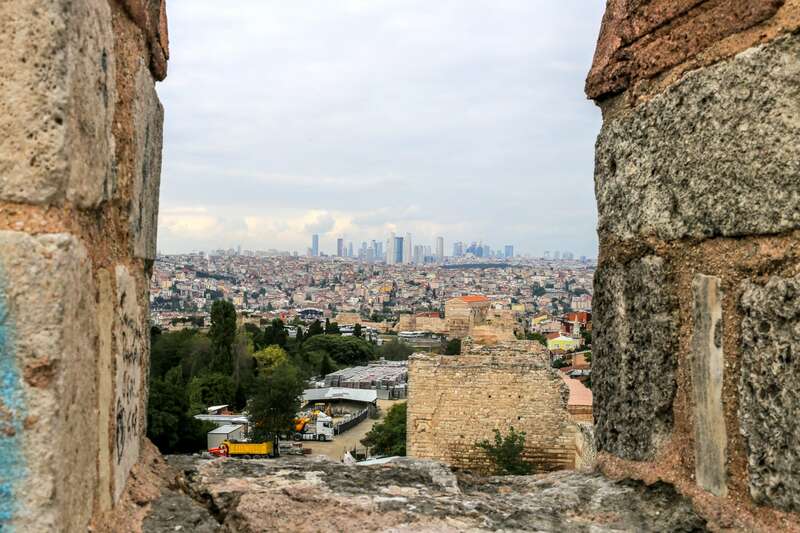 In many ways, it was a fitting end to a week in Istanbul, beginning with the city’s ancient past and ending at a look towards the future. 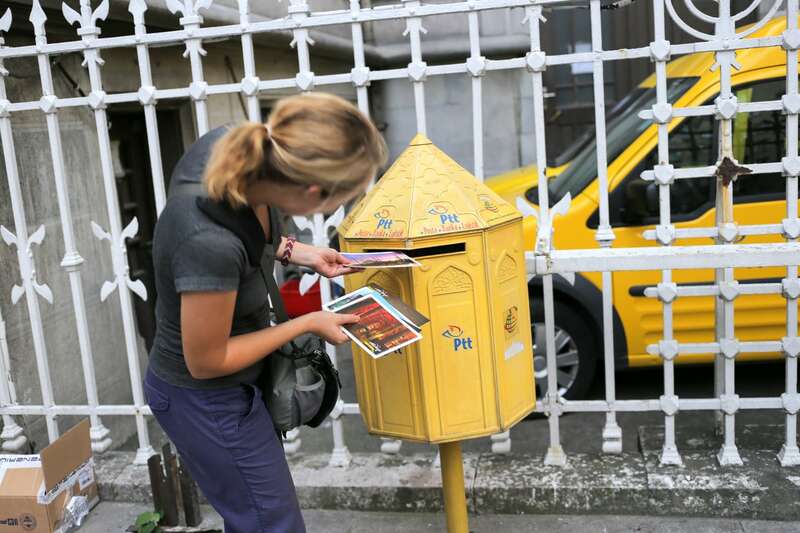 So, we bought some post cards and airmail stamps for family and friends, instead, and proceeded on a wild goose chase for what seemed like the only mail box in all of Sultanahmet. A few hours later, we were back on a plane bound for Cape Town!